Timothy is now sitting up on his own. It happened so fast — like one day he was lying on his stomach and the next day he’s sitting up, leaning forward like a Black Jack dealer in Las Vegas. We’ve mentioned before that it’s been a big help to work with Jan and Joan from the school district and this was a good example. 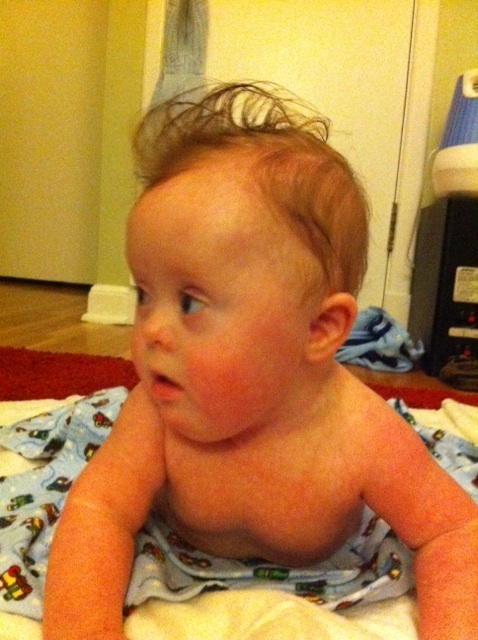 Sitting up on his own has been an early milestone on Timothy’s development plan. Joan emphasized that sitting up requires a baby to use both his stomach muscles and back muscles, support a large head and balance himself using his legs as a base. She gave us exercises to work with him and encouraged him to spend a lot of time on his stomach. It’s been neat to watch him progress in each of these elements and gradually be able to sit up on his own. Even though he’s just sitting on the floor, he can play with his toys differently and seems more a part of the home life than when he’s wallowing on his belly. Another example of the J&J twins was Jan asking about Timothy sometimes looking out the corner of his eyes, but always out the left side. She said that it could be a sign of muscle weakness or other issues with his eyes. So Timothy went to the eye doctor this week and was found to have an astigmatism (an irregular shape to the eye which affects vision) in both eyes. The doctor said that this is not unusual for kids — occurs in as many as one third of all kids, and is twice as likely in kids with Down syndrome. There is nothing to do now, and we’ll go back in a year and would likely proceed with eyeglasses, which delighted his sister, Catherine, as she is sure that glasses will look very cute on him. The doctor said that Timo has probably been making an adjustment for his eyesight by cocking his head — bringing a slightly blurry picture into better focus by looking out the left corners of his eyes. It’s interesting to think of how these babies make sense when things aren’t working properly, but find a workaround to make it better. Babies come equipped to emit all types of smells, and as a ‘new’ parent, it’s easy to become immune to these fresh scents. So no surprise the other night as Catherine and her friend Madeline got in the car after soccer practice and started remarking on the ‘gross baby smell’ in the car. The only thing I am better at than not smelling baby odors is ignoring complaining kids when I can’t do anything about it. As it turns out, they were right about a unique scent, but it was the result of a small amount of raw hamburger meat that had been sitting (in tin foil) tucked in a corner in the back of my car after a barbecue two days prior. And while the girl detectives were wrong about the source of the stink, thank goodness that they were not shy about highlighting the gross smell. So as much as we talk about the importance of patience, you still need to remember to clean your car out right after a barbecue. Or the scent will make life with a baby smell like heaven. This entry was posted in Doctor and tagged Eyesight, Jan & Joan, sittting up. Bookmark the permalink.